Exciting news in 2011 - Rivers Edge won two of the artisan cheese awards in the first-ever Good Food Awards competition! In January, Pat received her medals for her Siltcoos and Mayor of Nye Beach cheeses at the ceremony hosted by Alice Waters in San Francisco. In 2010, Sunset Bay continued to wow the judges at the ASC competition, bringing in another medal and coming in at 3rd place. The square Mayor of Nye Beach did even better, bringing in a 1st-place medal in its category. Rivers Edge went global with two awards at the 2009 World Cheese Awards competition, with silver medals for both Astraea and Sunset Bay. At the American Cheese Society's 2009 competition, one of our newest washed-rind cheese, Astraea, took a second-place medal, and perennial favorite Up In Smoke placed with a solid third. At the 2008 ADGA competition, Sunset Bay received a stunning "First In Category", and two of our bloomy rind cheeses, the new Siltcoos and our old favorite Yaquina Bay, each took third place in their categories. We're pleased to announce that two of our favorite cheeses, Sunset Bay and Up In Smoke, have each won silver medals at the 2008 Wisconsin Cheese Maker's Association World Championship! We sent in samples of our cheese to the American Dairy Goat Association's October 2007 Cheese Competition, and were thrilled that they liked them as much as we do! 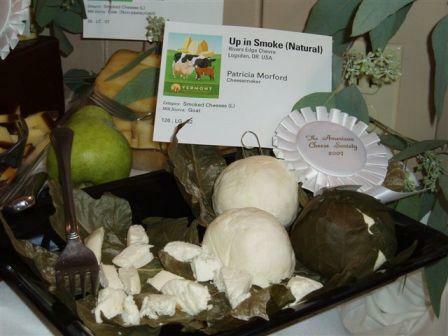 With two first-place winners (Up In Smoke and our fresh chèvre) and two of our bloomy-rind cheeses (Sunset Bay and Humbug Mountain) placing high, we're looking forward to this year's event. 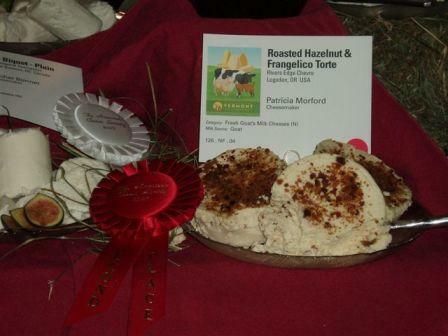 And in August 2007 our cheese impressed another panel of judges, at the American Cheese Society's annual competition, with our delicious marinated-chèvre Confetti Moons taking a first-place prize and our Roasted Hazelnut and Frangelico torte in second place. Look for our award-winning cheeses at stores near you!